The CBSE has refuted the reports which advocated the leakage of NEET Phase II question paper. The clarification came in response to the media reports which stated that the Uttarakhand Police has seized a group of people on the charges of allegedly selling the NEET II question paper a day in advance to the NEET II exam conducted on 24th July. The CBSE officially announced that the news of attempt of leakage of NEET II question paper is false and far from facts. 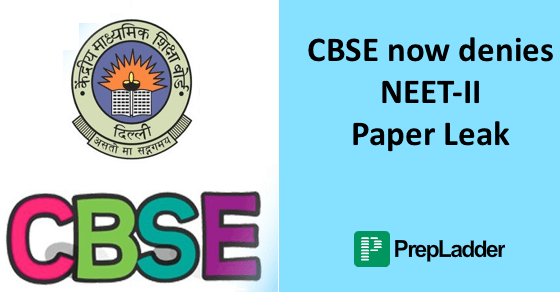 The Board further stated that in order to reach a conclusion, an expert committee of the CBSE scrutinized both the original question paper and the paper sold by the group. The board stated that the content of the question paper sold by the group was altogether different from the original NEET question paper. The Board officials stated that the material seized by the Uttarakhand Police from the culprits was provided to the Board and the material was cross-checked with the original question paper of NEET II. After scrutiny, the expert committee found that the seized material was completely different from the original question paper of NEET II. The officials added that it was an attempt by some deceitful and unethical elements to cheat the candidates on fake promises. NEET Phase II had been conducted on 24th July 2016 across the country at 739 centres in 56 cities. The Board reassured all the stakeholders that the exam had been conducted fairly across the nation. The officials added that strict vigil had been maintained at all the centres and no untoward incident had been reported. As per the official sources, approximately 4,75,785 candidates had registered for the examination and preliminary reports state that more than 90 percent of the candidates appeared for the examination. The combined results of NEET I and NEET 2 are awaited on August 17, 2016.